Great to be training another set of 10 #Forestry #Supervisors this last week deploying the #DJI #MavicPro #Phantom4bringing #UAV / #Drones / RPAS (Remotely Piloted Aircraft Systems) to be a regular tool being used by our field foresters with our Forest #Industry here in New Zealand. This course allows them to get there UAV Civil Aviation Authority CAR 101 wings badge and certification together with basic flight competence and craft knowledge. 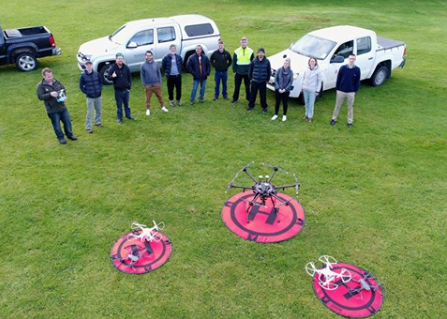 This Drone / RPAS / UAV course is run together with our Partners at Massey University School of Aviation. Task training at RPAS level 1 operator competence (basic flight of small pro-consumer grade RPAS as a camera on a pole for inspection and observation work). The course is led by Interpine and Massey University flight instructors. You will be assessed via a series of multi-choice and short answer questions, and flight testing using DJI mutli-rotor craft. Why do you need this course? The course is designed to get participants really thinking about RPAS / Drones in the airspace environment, awareness of other airspace users and most of all – safety, risk and best practices in the roll-out of drone technology within the forest industry and rural fire sectors. Whether your just managing company policy around drone implementation or a supervisor / harvest contractor wanting to get started using drones this course will ensure you get started on the right foot. If your interested in future courses this year contact our team, course schedules are available below for 2017.